Justin Randall Timberlake (born January 31, 1981 in Memphis, Tennessee) is an American singer who came to fame as a vocalist in the pop band *NSYNC. 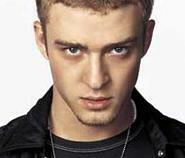 Justin Timberlake's career began after a childhood stint on the American television talent show Star Search, when he became a cast member of The New Mickey Mouse Club teenage variety show. His co-stars on the show included fellow pop singers Britney Spears and Christina Aguilera, as well as *NSYNC bandmate Joshua Chasez. In the summer of 2005, Timberlake started his own record company, JayTee Records, in which he promptly signed underground hiphop artist, Joshua B, as the labels 1st act.